Do you want to meet Ron? Wanna ask him a question? Take a picture with him? Just see for yourself if that's really tequila he's drinking? If your answer is yes, then you're in luck, a few spaces are remaining in his Meet & Greet! 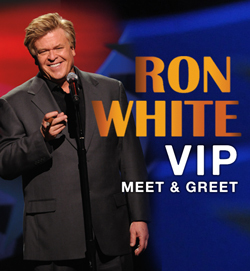 At the Meet & Greet, you'll be a part of a small group of fellow fans talking and having photos taken with Ron White. Not only will you get this special access after Ron's show, you'll receive a VIP access pass personally signed by Ron White.